THE ROMANY LIFE: Our Redwood Went In For A Little Tweaking! Off she goes! To the RV Doctor! It has been a while since our fifth wheel has traveled. We have been stationary here in our park, watching fall turn to winter and enjoying our new minimalist lifestyle and loving the heightened enjoyment our life has with less and less "stuff" forcing us to bow to it's demands. I am a minimalist in my soul, and finally I get to start actually living the life I have been dreaming of for some time, but that's another post! Owning a brand-new RV (I think I will get universal head-nodding on this from other RVers) is both a blessing and a curse. From what we have been able to understand from our years of experience and research, there is NO brand that is exempt from the "RV RULE OF QUALITY CONTROL" which is: There ain't much! Our Redwood has it's share of "QC" issues, although we have been satisfied by how much. It's all about how they deal with problems, and so far, we are very happy. This will be our second trip for warranty repair work. None of the issues we have had have been so bad that we were uncomfortable (like the climate control not working or the water system, etc.) Still, they were strongly things that we were glad we were able to get fixed and should never have left the factory. Again, for some reason, this is chronic in the RV industry, and when you buy a new RV, you will save yourself a lot of frustration if you just expect it. I even advise you to go ahead and make a service appointment when you take delivery of your new RV, even though it may seem silly. I promise, stuff will come up that needs to be fixed, and often there is a several-week wait for an appointment! This time, we are going in to have a new buffet top put on because when our shades fell off on one of our early trips, it gouged the surface. We also have issues with our LED lights in one of our awnings and some moisture build up in our nose cap. There are several other things too. We keep a running "Punch List" of items and then when the list starts getting long, we make our appointment with service. 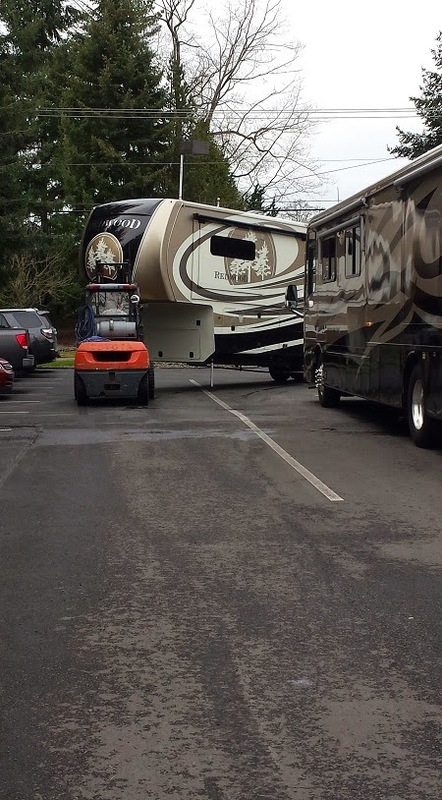 We go to the dealership where we purchased our RV for service, but that isn't always necessary. Depending on your manufacturer, you can usually go to any convenient authorized service center for this. This is a major consideration when you purchase your RV! DO NOT assume that you won't need extensive service, MOST people do! Choose a GOOD service center with skilled technicians and a strong communication connection with your chosen manufacturer! I advise you to do a little homework and read reviews of the different dealerships and service centers. There are HORROR stories from some, and glowing reviews from others. You will be glad you did!